Job Vacancies at Landmark Group. Landmark Group is a well known Dubai based multinational conglomerate company which sells footwear, apparel, beauty products and cosmetics, electronics, home improvement products and baby goods. The Landmark Group also has interests in the leisure and hospitality industry as well as mall management and healthcare. The Landmark Group has a number of in house brands and also retails other brands in its stores. As a large scale prestigious employer,the Landmark Group offers a vast number of opportunities both in Dubai and in other countries in which they have a presence. They also offer a number of varied positions across both the hospitality and retail sectors for workers at all levels of their career, so whether you are an experienced candidate with many qualifications or someone who is just starting out on their working life, there is sure to be a position to suit your needs. The good news for job hunters is that there are plenty of exciting opportunities with the Landmark Group. With positions across their baby shop, corporate, lifestyle and home center brands, there are roles to suit anyone. There are both full time and part time positions available on both permanent and temporary contracts to suit the needs of a wide range of workers. If you are looking for the latest job vacancies at Landmark Group the best place to start is the company's own website. There is an entire section dedicated to careers so that you can easily search for the right position to suit your needs. You can either search by sector, by brand or by country so that you can be certain of finding something suitable. What Kind Of Skills Will I Need To Work At Landmark Group? With so much variety in the positions available with Landmark Group there is no single skillset required. The kind of skills and qualifications necessary will very much depend on the position being applied for. For an entry level position, such as a warehouse picking and packing role, the educational requirements are minimal, although a year of similar experience is necessary. For a more senior position more extensive experience will be necessary as well as an industry specific qualification such as a degree in a relevant subject or relevant certification in a recognized field. English language or Arabic language skills may be required for certain positions and good customer service skills are required for any role which has contact with the public including all customer service positions. Some roles may have restrictions in terms of age or gender depending on the position. For example, physically demanding warehouse jobs are only suited to candidates under the age of 35 and may require only male applicants due to the nature of the work. 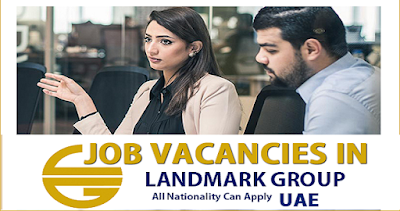 If you want to apply for job vacancies at Landmark Group, you can apply through the company's own jobs page on their website. Simple register for a user account on their careers portal, upload your CV and personal information and then you will be able to apply for any of the roles that you are interested in.